A. The ordinary capillary type specific gravity bottle with a neck of 6mm diameter. B. 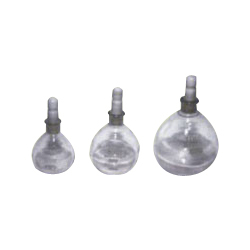 The wide mouthed capillary type specific gravity bottle with a neck of 25mm diameter. The ordinary specific gravity bottle is used for materials which remain absolutely fluid at 270C while the wide mouth capillary type is used for materials which remain semisolid of high viscous at 270C.